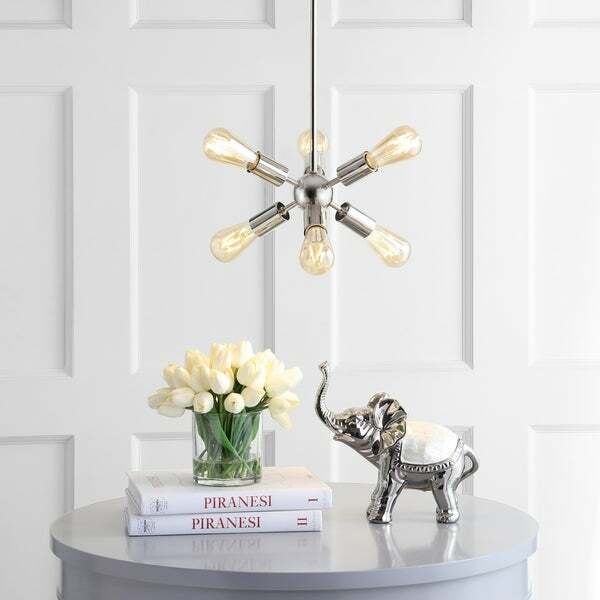 As far as home décor of the 1960s is concerned, there's one fixture that made the crossover from midcentury modern to traditional homes -- the sputnik light. Inspired by the space age, but updated for today, this miniature version is adjustable in drop so it can suit any ceiling height. Employing six bulbs but only 17.5" wide, it can be used as a chandelier or pendant, emitting a lot of light for its small scale. Dimensions 14.0 In. X 17.5 In. X 14.25 In. "Can this be hung on a vaulted ceiling?"